When crafting or sewing, you may choose to listen to music while you work. If you decide to take on new projects or use a guided video on YouTube, speakers will become necessary also. I know I like to set the mood for sewing so I’ve put together a selection of the best speakers for your space. To begin with let’s see what this first one has to offer. This rectangular shaped speaker comes in the colours black, red and blue. The lithium ion battery coupled with Anker’s leading power management technology gives it a 24 hour or 500 song play time. The superior sound quality causes the sound to fill the room for a full bodied experience if that is what you desire. The clarity is enhanced by the less than 1% harmonic distortion this model offers. You can connect your other electronic devices to it via Bluetooth over a 66 foot range. The auto connect feature allows it to automatically connect to the last device it was paired with. If you receive a call on your mobile you can talk hands free via the built in microphone. The speaker also comes with a USB charger and a year and a half warranty. You can completely immerse yourself in the crispness of the sound from this speaker playing your favourite music. Or you can become an astute DIYer as you listen to and watch instructive videos. However you choose to use these speakers in your craft or sewing room, you will be pleased. This speaker model comes in the colours blue, black, red and white. It connects to external devices via Bluetooth and uses the ios or Android applications for greater control. This model gives 50 hours of air time when functioning from the rechargeable battery. This compact speaker also includes an actual microphone so that you can also use it for events. The AM/FM frequency radio allows you listen to your favourite radio station while you are crafting or sewing. Apart from the microphone jack it has an auxiliary port with an auxiliary cable included. A USB port is housed on the other side of the speaker to charge other USB capable devices. The actual speaker volume and microphone volumes are controlled by separate dials. 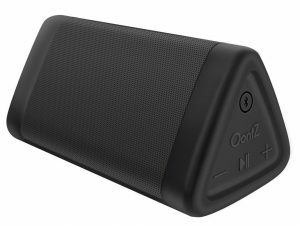 This speaker offers 12 hours or half a day of play time. This is not bad considering that most of your at home crafting or sewing projects will not have you going for that long. It comes in the colours blue, red, pearl white and black. The sound quality is high definition and control of volume and music is at touch of a button. The sound produced has a great surround effect with impressive bass. Connectivity to devices is via Bluetooth 4.0 technology. The last device used is stored in its memory for automatic connection the next time around. Total recharge time takes about three to four hours with the USB cable. This speaker also has a very pleasing blue light when it is powered on. 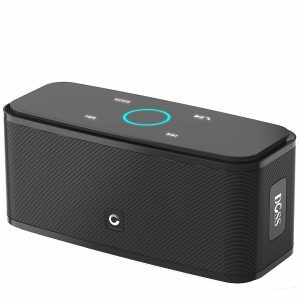 This next Bluetooth wireless speaker delivers excellent sound quality for the sewing or crafting room. The rich sound quality has the ability to fill the room with precision and clarity of bass, mid level and high level sounds. This Cambridge SoundWorks speaker is quite durable as it is resistant to water splashes or sprays. It is also resistant to dust and sand. Caution should be exercised not to submerge it whether partially or fully in water as this will cause water to get into the interior. 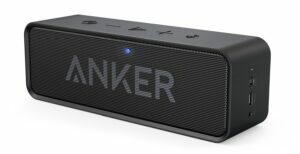 It is just over half a pound in weight and delivers about 12 hours of continuous sound. The shape is pyramidal and it has bevelled edges all around. If you receive calls on your mobile device, this speaker has a built in microphone which allows for hands free conversation. It comes in red, black and blue and includes an audio cable as well as a USB charging cable. This speaker can connect whether by wireless Bluetooth or by means of a wired connection. 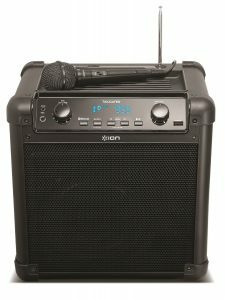 These features allow it universal compatibility with any device with Bluetooth capabilities or an auxiliary port. A fully charged battery gives 10 hours of playback time and the sound quality is as clear as crystal. The two speakers give a combined output of 12 W, each being 6W. The built in microphone allows for hands free conversation via your mobile device. Head back to CHAPTER 3: The Ultimate Guide to Setting up your Sewing Room!